Each winter, Vanessa Creech-Terauds, an FEI Young Rider, packs up and leaves her frigid base in Caistor Centre, Ontario, with her mother, Diane Creech, to join the ever-growing group of dressage athletes in the winter equestrian capital of the world — Wellington. 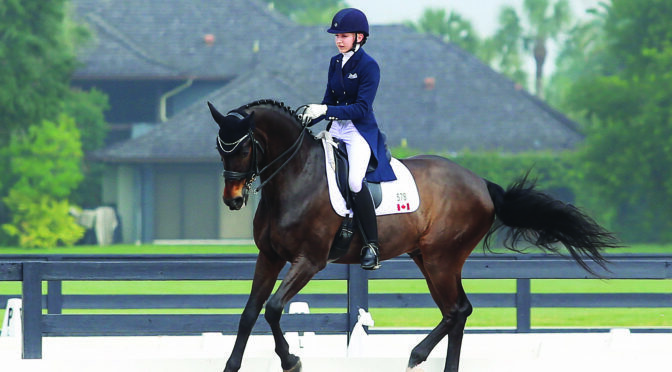 The 17-year-old Canadian dressage rider began riding at a young age with the help of her mother, an international Grand Prix competitor who won a silver medal at the 2007 Pan American Games. Just like her mother, as Creech-Terauds grew into an adolescent, her passion for the sport of dressage continued to grow. “When I was 12, I decided I wanted to train in dressage more seriously, and ever since then it has been dressage every day,” Creech-Terauds explained. She is inspired by her mother’s dressage experience and success. “Many people believe that I have a lot of pressure to live up to my mom’s expectations, but it just gives me more drive and helps me believe in myself,” Creech-Terauds said. With the support of the Minnesota-based Leatherdale Farms, Creech-Terauds has achieved great success in the dressage world. She competed Leatherdale Farms’ 8-year-old Hanoverian mare Fleur de Lis L to individual and freestyle silver medals at the 2016 North American Junior and Young Rider Championships (NAJYRC) in Colorado. It was their first year competing together as a pair, and they earned impressive scores of 70.184 percent in the FEI Junior Individual test and a 70.55 percent in the FEI Junior Freestyle. Having had the opportunity to experience competing at prestigious international competitions, such as NAJYRC and in multiple CDIs, Creech-Terauds has developed her skills at a rapid pace. Throughout the 2017 Adequan Global Dressage Festival, Creech-Terauds will move Fleur de Lis L up from Juniors to the Young Rider division, as well as compete her second Young Rider mount, Rob Roy, a 13-year-old Hanoverian gelding owned by Leatherdale Farms. She also plans to compete in the Florida International Youth Dressage Festival with Fleur de Lis L, and has hopes to compete in the international CDI ring. Even in the midst of her rigorous training and competition schedule in Wellington, Creech-Terauds focuses on achieving her academic goals online. Her mother expressed her gratitude for Leatherdale Farms’ support of Creech-Terauds. “I am very grateful to Louise Leatherdale for sponsoring Vanessa and helping her live her passion and have her dreams come true,” Creech said.